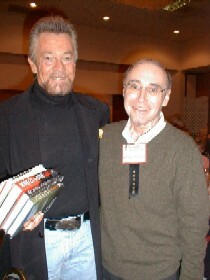 Bob with Stephen J. Cannell, two of 35 authors who appeared at the second annual "Men of Mystery" event in Irvine, CA, on Oct. 27, an opportunity to spend time and sign books for some 350 participating fans. 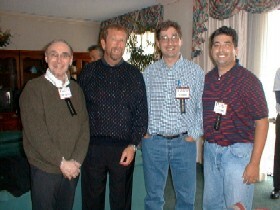 Steve, the TV series writer-producer legend who's transformed himself into a best-selling mystery author, was one of the principal speakers. Bob and three other faces in the crowd (from left) Charles Knief, Lee Goldberg, Lee's younger brother, Tod. Chuck's popular series of novels set in Hawaii was recently optioned as a potential TV series. Lee continues to alternate between writing-producing for TV and writing his mystery novels. Tod recently added a teaching stint at California State University, Northridge, to his novel writing.